If you know me well, you know that St. Patrick’s Day Science has always been one of my favorite things. When the boys were knee high to a grasshopper I would pull leprechaun tricks like making all the faucets poor out green water. But as they have gotten older I have really had to step up my game. That is why I was clicking my little green leprechaun heels when my buddy Susan invited Carter and I over for a St. Patrick’s Day Science Play Date with Steve Spangler. What was fun is that Carter came and learned how those tricky Leprechauns work and may have some sneaky up his sleeve for Connor this year. But I am not telling. Steve shared all kinds of fun leprechaun tricks to bring science to life at home. And the good thing is that most of it can be done at home with simple materials OR if you’re pressed for time you can buy a ready made kit-giving parents options! One of the things I never did with the kids was set up a Leprechaun trap. This would have been so much fun. 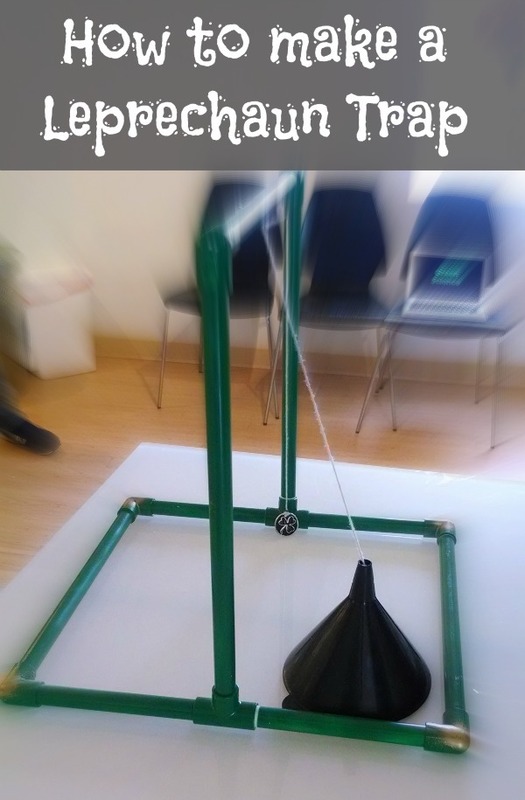 Here is one great model that I saw at the Spangler workshop. The model on the table could easily be made from a grow light stand if you have one and a funnel. If you don’t, this is an easy PVC project. Maybe Dad wants in on the action? The picture below shows you the basic frame you need but let your kids get creative and see what they come up with on their own. Here are exact Leprechaun Trap instructions if you want some creative help. 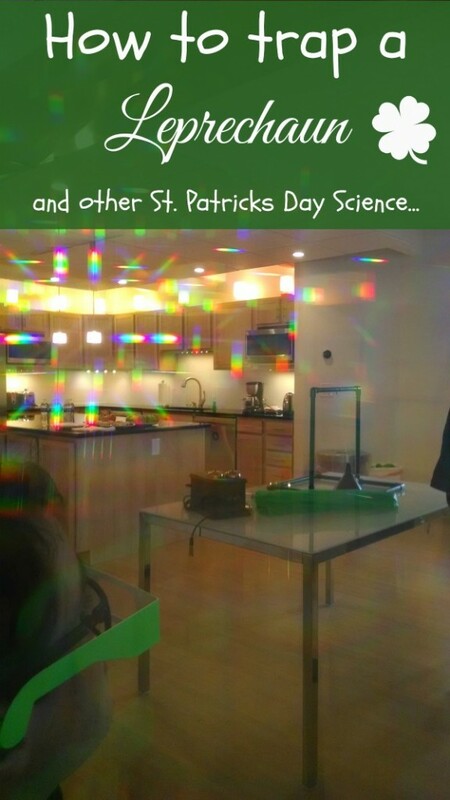 The rainbows are coming from the diffraction grating glasses that are in the Leprechaun Kit. I put them in front of my Droid Ultra and took this amazing shot (shout out to #VZWBuzz for the phone). You can make something similar at home with this Homemade Kaleidoscope. Here is a closer look at the Leprechaun trap shown in the picture above. Get the Leprechaun Science Kit. All the ingredients come with it and its super easy for parents to teach science with. It gives you a handy dandy guide that will make you look like a genius with the kids. It’s 25% off today. 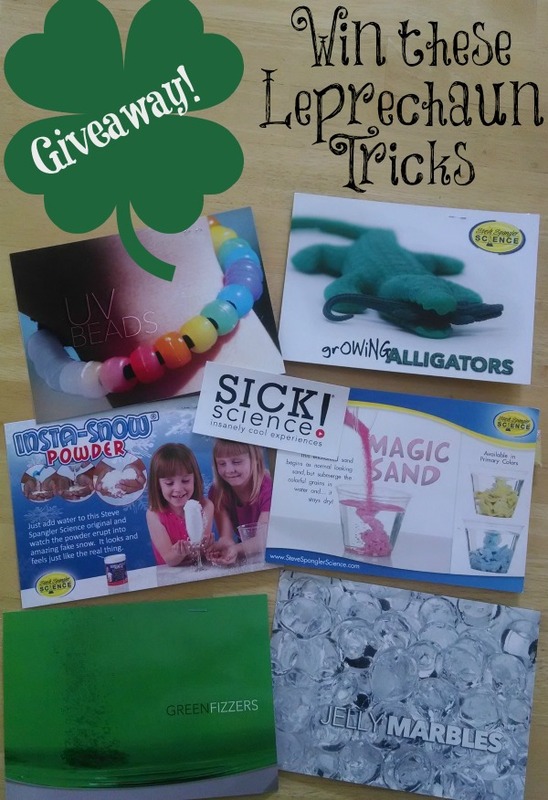 St. Patrick’s Day Science Leprechaun Tricks Giveaway — OVER!! It may seem like I work for Spangler Science with as much as I talk about them. I don’t. At all. I was a huge fan girl of Steve before I ever met him. It started when I was teaching 4th grade Science in Las Vegas. Moving to Denver and getting to have play dates with him is just a huge bonus. Just like all the science materials he keeps Carter and I well supplied with. This last time I was there I got two sets of these sample cards (so there will be two winners of the 6 cards seen below) that I want to share with all of you. I love our St. Patrick’s day tradition of baking and frosting brownies and then adding a gold coin on the top of each slice! My favorite part has always been seeing my sons face at the mess the leprechauns made in our house. Sometime there’s spilled glitter or an over turned chair. I love any chance to wear green. St. Patty’s day gives me a little more permission to wear green! I love all the cute clothes that they have for kids to wear! My hubby would say green beer, but I like crafts with the kids. 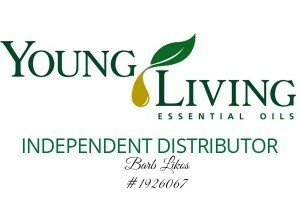 i love making green pancakes, cup cakes, and cookies!! Barb – we are so appreciative of all the love and support you’ve given the Steve Spangler team over the years. And oh my! how Carter has grown up. It was so exciting to finally have him come along and do science with us. I love to make crafts and activities with my sons. Have you ever made rainbow waffles? Cut them in half and they really do look like a rainbow! I love when the leprechauns come to our house the week before St. Patrick’s day and play silly tricks on the kids. I like the Irish food being readily available around St. Pat’s. St. Pat’s also brings back a lot of good memories. I went to an engineering college, and St. Pat’s week was an amazing time. I am always reminded of good times with great friends. I have a wee bit of Irish heritage, so I love all the focus on all things Irish! St Patrick’s Day has always been special to me. Met my husband at the St. Paddy’s Day Parade. Got engaged on St. Paddy’s Day at the parade. I have been teaching for 23 years and love my Great Green Gala party for my students every year! Would love to incorporate some of this super science fun for them and my own children. Hope I have the Luck of the Irish! 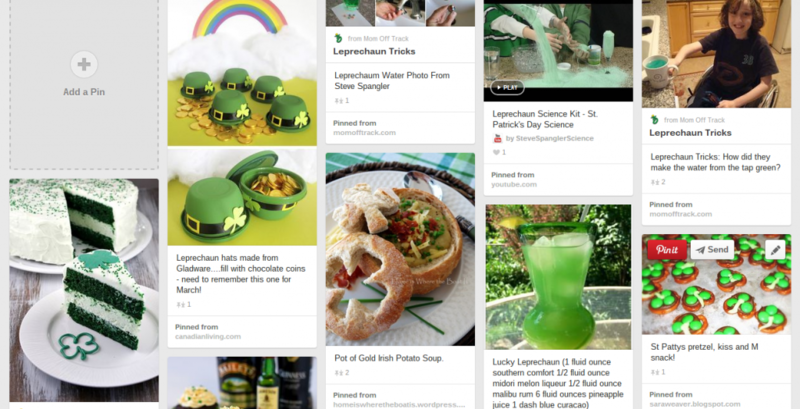 I like the light-hearted fun and playfulness of St. Patrick’s Day! I love the idea of celebrating something related to my heritage!